U.S. Secretary of the Department of Interior Sally Jewell address the crowd during the official announcement of the $554 million settlement ending years of litigation between the Navajo tribe and the federal government. The Navajo Nation filed the lawsuit against the federal government in 2006 for the mismanagement of its trust assets. 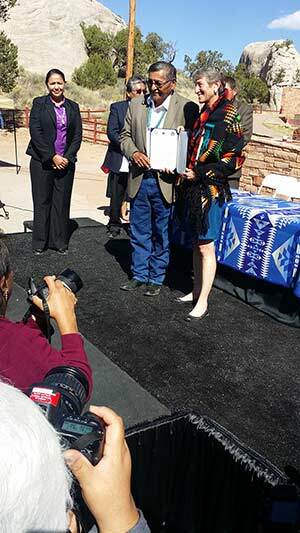 TOP: Navajo Nation President Ben Shelly and U.S. Secretary of the Department of Interior Sally Jewell hold the document signed by a number of tribal officials indicating the official acceptance from the Navajo Nation tribal officials of the $554 million trust settlement. 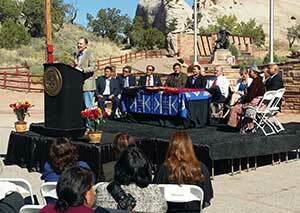 BOTTOM: U.S. Assistant Secretary of the Department of the Interior was one of 9 speakers at the Trust Settlement Agreement Signing Ceremony, held Friday, Sept. 26 in Window Rock. In order to find out how the $554 million that the Navajo Nation will receive from the U.S. government for mismanaging the tribe’s trust assets through a “historical” settlement, Navajo Nation President Ben Shelly is encouraging the public to vocalize their thoughts. “Navajo people need to speak up,” Shelly said in a press conference interview with U.S. Department of Secretary of Interior Sally Jewel and Navajo Nation Council Speaker Pro Tem LoRenzo Bates. “First and foremost, I want to ensure the Navajo people have their recommendations,” Bates added, noting that the first public hearing on how the $554 million should be invested is scheduled for Oct. 6 in Chinle. In 2006, the tribe had filed suit against the U.S. in the Court of Federal Claims for “damages, interest, fees, costs and other relief against the United States” that date back to at least 1946. The tribe had sought $900 million when it first filed its suit. And according to Jewel, the half-billion settlement, which was reached between the Navajo Nation and U.S. government back in May, would be available and deposited into tribal coffers by the end of the calendar year. Of the 80 cases reached between the feds and Indian Country, Washburn explained that the Navajo settlement is considered the largest and exceeds the next major resolution by $170 million. Both Shelly and Jewel added the settlement would not have been possible if both parties in the suit had not found common ground in their negotiations. “We both got to stop spending money on lawsuits,” said Jewel, before adding that the litigation also signifies a new chapter and how the Obama Administration is committed to helping Indian Country. The secretary added that “government to government relationships is how we go forward” with Indian Country, and she also noted that the millions the Navajo Nation will receive is going to empower the Navajo people in some fashion. In the press conference following the signing ceremony, Shelly told media outlets how he would like some of the funds going toward “shovel ready” infrastructure projects listed under a five-year capital improvement plan, while Bates sees the funds going directly toward scholarships, housing, roads, and energy development, among other needs. “The list goes on,” Bates said, adding that the tribe by hosting public hearings is exercising its sovereignty to determine the allocation of the funds. The signing ceremony of the half-billion settlement also focused on the efforts of the respective lawyers that were involved, particularly the Navajo Nation’s staff attorneys and outside counsel from the Nordhaus Law Firm and BuckleySandler, LLP. Navajo Nation Attorney General Harrison Tsosie said that the myriad of lawyers involved in the settlement helped the U.S. government begin to recognize the dialogue with Indian Country and how wrongs of the past are now being remedied. The tribe’s attorney general added that the federal lawsuit – Johnson vs. McIntosh, a legal principle of property law that applies to tribal lands, served as a precursor to the settlement. “We wouldn’t have had a settlement this large without evidence,” he said.